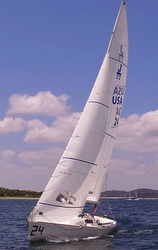 (Houston, TX)- Texas is a stronghold for the J/22 one-design sailing; areas like Galveston Bay can see 18 boats on the line for Wednesday night racing, which makes for plenty of competitive racing. Sailing his J/22 consistently throughout the seven regattas making-up the Texas J/22 Circuit, Doug Weakley (Corpus Christi, TX) came out on top after winning four events and placing well in the remaining three. “2018 started out great with Jim Kondziela and Joe Mayfield sailing with me on HNL (#24) at the Houston Yacht Club’s Midwinter regatta. We were really fast throughout the event and starting with a bullet in race one. We were pretty excited about our 6th place finish in the 39-boat fleet, competitive fleet. We then sailed using our new radial jib at Austin Yacht Club and took first in a competitive fleet made of locals and traveling boats. 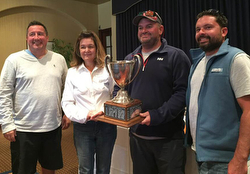 We got back into the boat in the fall and took back-to-back wins at Corpus Christi and Canyon Lake yacht clubs and the HYC Heritage Cup. At Corpus, we sailed with the cross-cut jib for power through the chop and we used it again at Canyon Lake in the light conditions. Canyon is all about avoiding a really bad race in the shifty conditions there, and we were the boat that did just that. At HYC’s Heritage Cup, we went back to the radial jib and we were very fast in all the conditions. Saturday started out in very light air and we were quick in the light stuff, coming back from a terrible start to win the first race. The breeze quickly built and our old boat was set up really well for it. The radial jib was great, the boat just felt really fast. We had great downwind speed also with the new spinnaker design. We look forward to more success in 2019, beginning with the J/22 Midwinters at Ft Walton Beach in March!” Thanks for contribution from Adam Loory at UK Sails. For more J/22 Class sailing information Add to Flipboard Magazine.